Today is a landmark moment in British royal history: for the first time, a monarch is celebrating a Sapphire Jubilee! 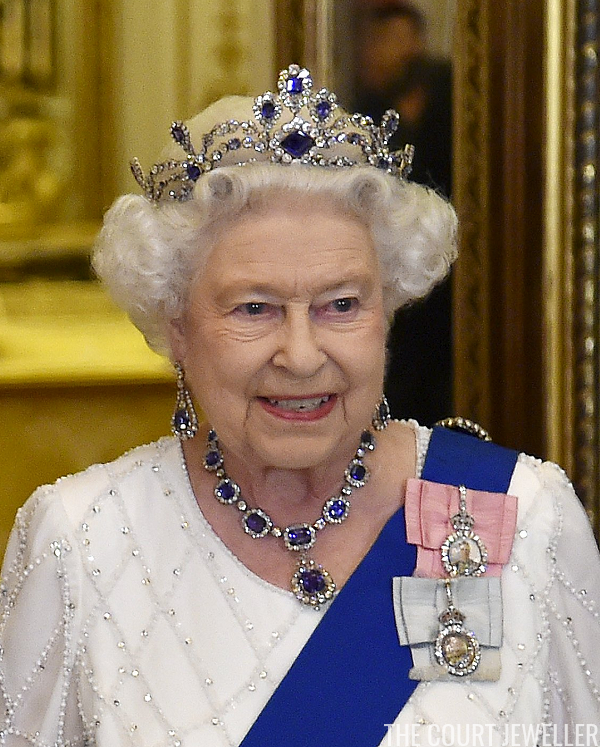 Queen Elizabeth II became sovereign 65 years ago today, and to help her mark the big occasion, here's a look at some of her most glorious sapphire jewelry. 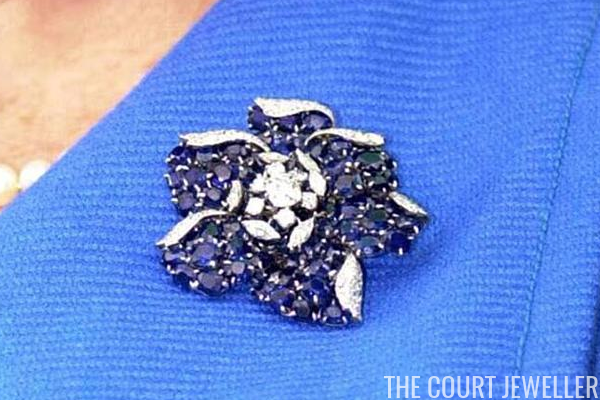 The Russian Sapphire Cluster Brooch: One of my all-time favorites from the Queen's collection, this sapphire, diamond, and gold filigree brooch is said to have been originally owned by Empress Marie Feodorovna of Russia. Queen Mary reportedly purchased it in 1934; the Queen wore it for the first time at the Vatican in 2014. 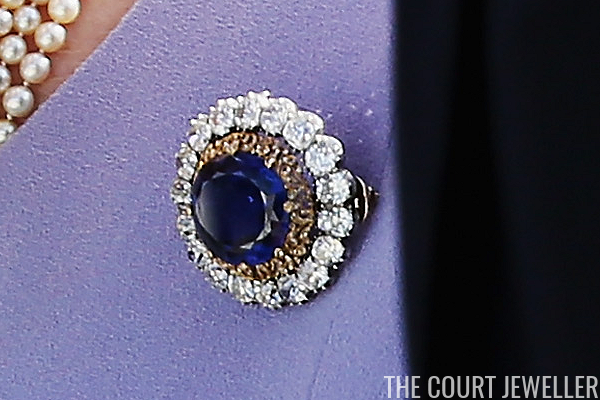 Queen Mary's Russian Sapphire Brooch: Empress Marie Feodorovna gave this lovely geometric brooch, which features a sugarloaf cabochon sapphire, to Queen Mary as a wedding gift in 1893. The Queen inherited it from her grandmother in 1953, and she's been wearing it now for more than half a century. 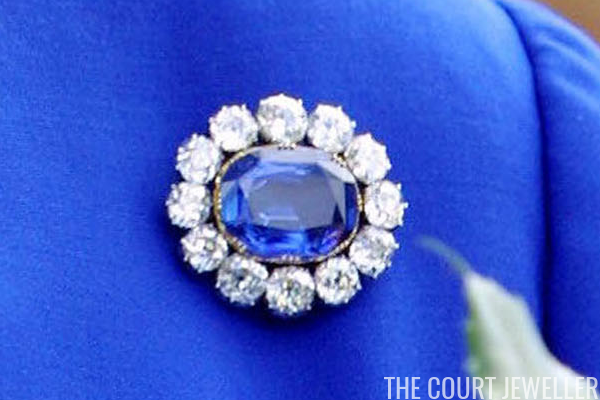 Empress Marie Feodorovna's Sapphire Brooch: This classic cabochon sapphire and diamond cluster brooch, which has a distinctive pear-shaped pearl pendant drop, was also from the collection of Empress Marie Feodorovna of Russia. She received it in 1866 as a wedding present from her sister and brother-in-law, the Prince and Princess of Wales (who later became King Edward VII and Queen Alexandra of the United Kingdom). 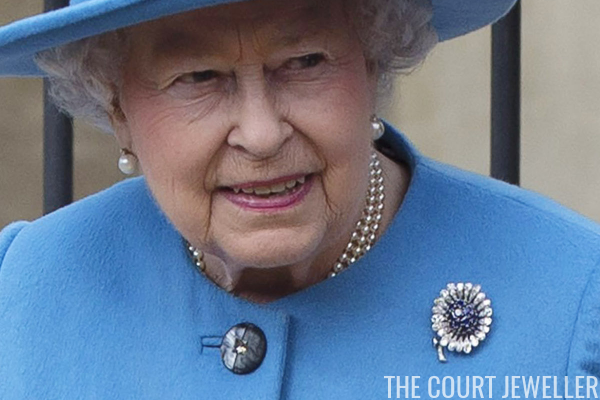 Queen Mary purchased the brooch from the empress's estate in 1929, and the Queen inherited it in 1953. She wears it occasionally, both with and without the pearl pendant. 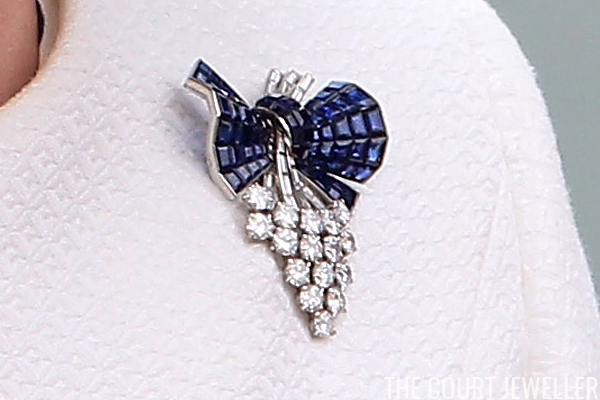 The Sapphire and Diamond Grapes Brooch: Not much is known about the provenance of this whimsical brooch, which the Queen inherited from her mother in 2002. The construction of the "bow" that gathers the grapes looks, I think, like it might be an example of Van Cleef and Arpels's famous mystery setting. 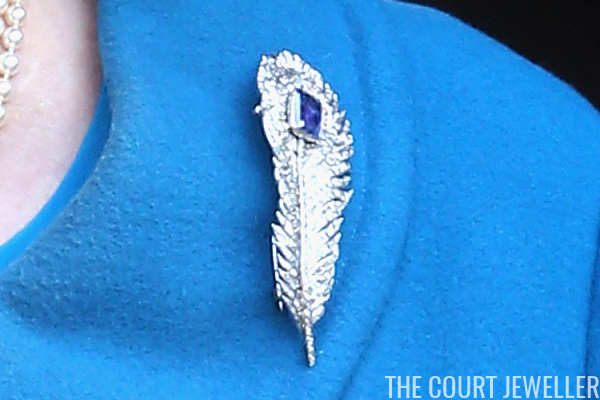 The Carrington Feather Brooch: This striking diamond feather brooch, which features a square-cut sapphire set at one end, was one of the Queen's wedding gifts. It was presented to her by Carrington, the company that made the piece. The Queen still wears it regularly. 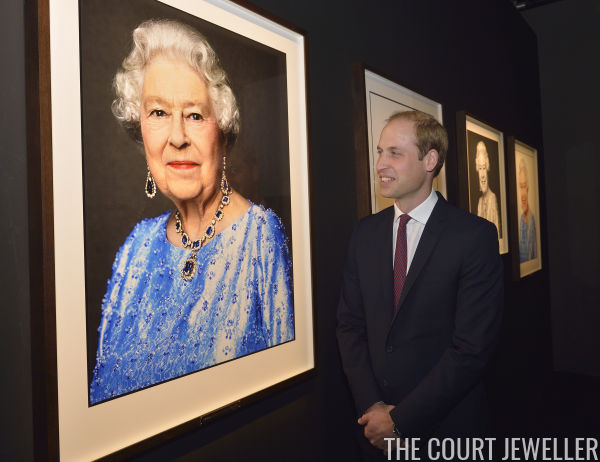 The Sapphire Chrysanthemum Brooch: This diamond, sapphire, and platinum brooch was presented to Princess Elizabeth in 1946 when she launched a new oil tanker. 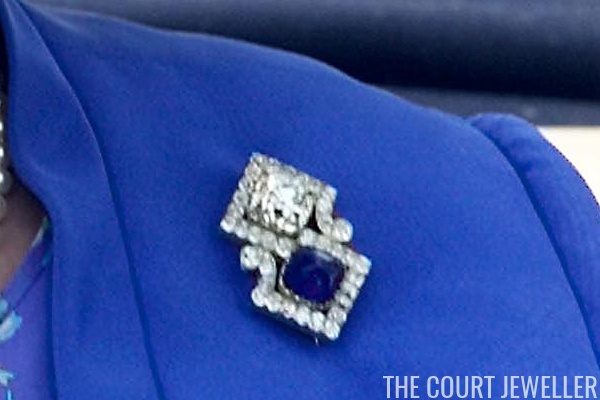 She famously wore it for a portrait taken during her honeymoon, and it's been a part of her brooch rotation ever since. 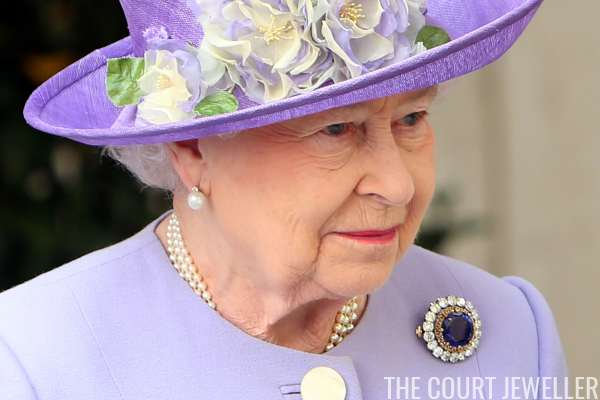 The Queen Mother's Sapphire Flower Brooch: This inventive, modern sapphire brooch was one of the glittering anniversary presents given by King George VI to his wife, Queen Elizabeth, during their marriage. 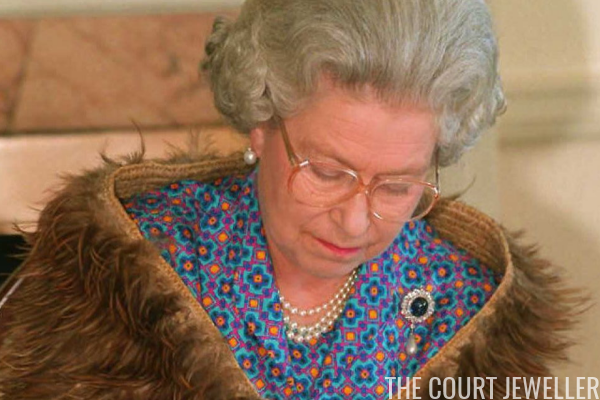 The Queen inherited it from her mother in 2002, and so far, she's only worn it once in public. I'm hoping to see this one pop up again soon. Note: This is an updated and expanded version of an earlier post.